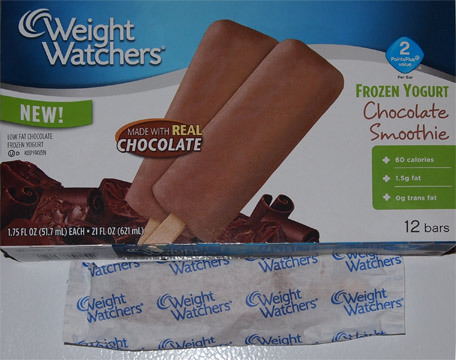 [New for 2013] Ok, I need chocolate, so let's dig into our stash of free weight watchers products again. 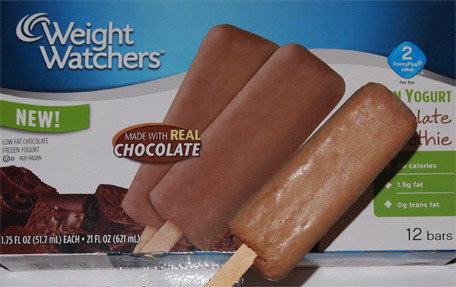 These are the Chocolate Smoothie Frozen Yogurt bars and they are the new variation of the Strawberry Smoothie bars that you've already seen on store shelves. 12 bars in a box with 2 to a serving. Just like the CnC bars, I'm again surprised at how small these are on first glance. That said, after ungracefully tearing the odd paper wrapper off, I'm totally having jell-o pudding pop flashbacks, plus at 60 calories a piece, it's totally okay to have more than one. It's fairly soft, quick melting, and basically reminds me of chocolate milk. You know, I'm kind of glad that it's the size that it is. I realize now that I've never been a big fan huge fan of the big thick bars, there's just something more simple and satisfying here. I'd rather have 1 or 2 of these than one big thick bar. Call it the old mental trick of forcing yourself to go slower. On Second Scoop: Now I only had one pop on the first try, and nothing really seemed out of place except for maybe a little something something. Well, I've had a few more of these and I will admit that something is off for me sometimes. Maybe it's the whole frozen yogurt thing, but sometimes a strange taste comes across when I eat these and it's kind of frustrating me >>> Ok, just looked at the box. There aren't too many ingredients, but chocolate liquor is one of them. I bet you five bucks that's what I'm picking up. These are fantastic and have a come back taste to me! I think they are great. Way better than fudge pops!